I would first like to start off by saying that today we left Zambezi and all made it safely to Livingstone. No one got sick on the bush planes this time, and we all got to see the incredible view of flying right over Victoria Falls. The past few days have been really hard for my fellow Zags and I. Before I left on this trip, I thought three weeks in Zambezi was such a long time. Now that three weeks are up, I want more. This has been a common conversation with my Zambian friends this past week. We can’t believe that our time is already up. We wish for just a few more weeks… maybe a 6 week trip would be enough time. But then I proceed to tell my friends that even if we had 6 weeks together, it still wouldn’t feel like enough time. This is because in the three weeks that I spent in Zambezi, I made friendships that have changed my life. I met people that truly left a footprint on my heart. People that made it hard to say goodbye. Even though I only knew these friends for only three weeks, I felt like they had always been a part of my life. It is hard for me to express all the ways that Zambezi has impacted me in one blog post, so let me just tell you about a family here that has changed my life. 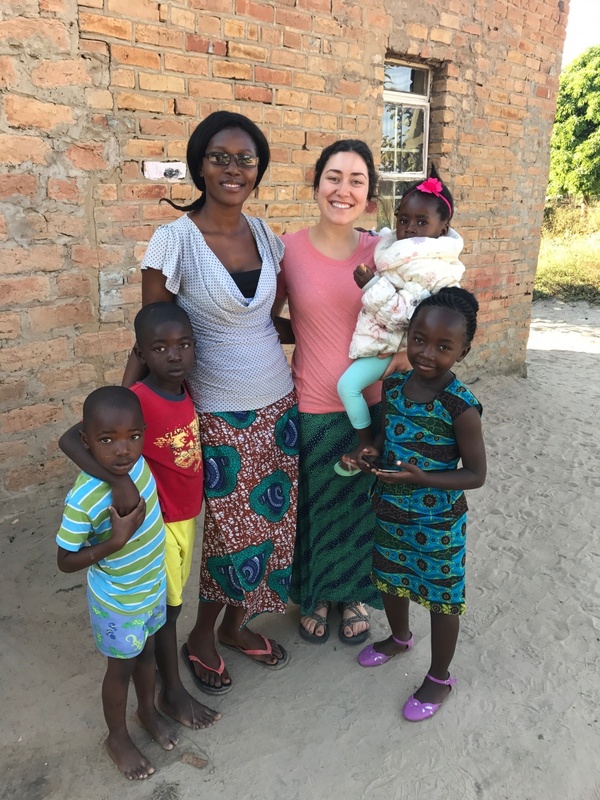 During our very first weekend in Zambezi, we had the opportunity to stay the night at someone’s home from the church community. When I say we had the opportunity, what I really mean is we were told we were doing homestays. Remember, this was our second night in Zambezi and as you can imagine many of us were already quite unsure and anxious of what was to come. Grant and I were both sent to stay at David and Gloria Sefu’s house. Now this is where everything started for me. David is a nurse and works in a rural village, Gloria is studying to be a secondary school teacher, and then they have two little girls, Shekinah and Kuunda. Shekinah is six, but is more mature than any six year old I know, and Kuunda is two and is just a bundle of joy. During our homestay, I could not believe how generous Gloria and David were to us. They welcomed us into their home, fed us dinner, let us sleep in their girl’s bunk beds, and even let us bathe (with warm water!) before church. I remember feeling overjoyed just for simply being accepted by them. That next Monday, I found myself wandering back to their house. Gloria had mentioned that she wanted to teach us how to make nshima, so I wanted to set a date and make it official. I was eager to keep this relationship alive. We planned to cook nshima on Wednesday, and I could hardly wait. Wednesday came along and Grant and I made the quick journey back to their house. Gloria taught us the proper technique for making nshima, which was way harder than she made it look. Grant caught on pretty quickly, but it took me another day to really get it. Along with nshima we prepared chicken, relish (veggies), and gravy (sauce). Lunch was delicious! I was so proud of our lovely meal and our blossoming friendship. From that point on, I went to Gloria and David’s house whenever I had free time. David was almost always gone since he travels so far for work and is only home on the weekends, but I found that I loved hanging out with Gloria and the girls just the same. Gloria taught me so much about Luvale culture and what it means to be a strong Zambian woman. I felt as if I could ask Gloria anything. I would ask her about the challenging things that I didn’t understand about Luvale culture. I asked her about what it means to be a woman in her community and whether she thought that was fair or not. I asked her what she liked and what she didn’t like about her country. One of the things that I loved about Gloria is that she asked too. We taught each other about important holidays and what crops are most commonly grown at our homes. We talked about deep issues and we talked about everyday things. We did dishes together, cooked meals together, watched cartoons together, danced together, and even walked to the market together. I taught Gloria and her daughters how to play Frisbee. They taught me how to make perfect nshima without any clumps. They introduced me to David’s mother, his sister, his niece, his brother, and many other friends. I introduced them to my friends from Gonzaga and they eagerly invited them into their home as well. They gifted me with their first ripe papaya of the season. I bought their girls candies from the store. They gave me a beautifully woven basket that they had someone make just for me. I gave them a Gonzaga bulldog cap and t-shirt. This friendship is something that I will never forget. Because of them, today was one of the hardest, but also most beautiful days of my life. This morning Kelen and I went over to their house to say hello and to say our last goodbye. David was just packing up and getting ready to head back to work, so we first said goodbye to him. We knew what was coming next, but we weren’t quite ready to face the reality of things. Instead, we tied shitange around our waists, blasted some tunes, and danced around their living room trying to will our hips to move as a traditional Luvale woman. Let’s just say that Shekinah showed both Kelen and I up. When we knew we should head back to the convent, because our planes were about to arrive, we all fell silent. I gave Shekinah a hug goodbye, Kelen hugged her goodbye, and then she threw her body on the floor and bursted into tears. I then made my way into Gloria’s arms, tears already welling up into my eyes, and we both loudly sobbed while holding tightly onto each other. Gloria told me that I had become more than just a friend, and more like a sister. I told her that I would never forget about her and that we would stay in contact via Facebook and WhatsApp. We ugly cried for a few moments extra, but knew that it was time. As we headed back down the sandy path home, I couldn’t help but to feel grateful. Even though I was feeling so much sadness with having to say goodbye to what is now my family in Zambezi, I was just as blessed to have this opportunity. I feel so honored to have met this family and to be graced with their presence. They taught me how to unconditionally love another person. They made me feel so important and cared for, and I hope that I was able to make them feel the same. Wow. All I have to say is thank you so much for being a part of my life, and thank you for everything that you have taught me. I love you so much. P.S. Mom and dad, I love you so much and cannot wait to see you. I have so many stories to tell you and pictures to show you! I am also really missing watermelon and bacon… breakfast Saturday morning? 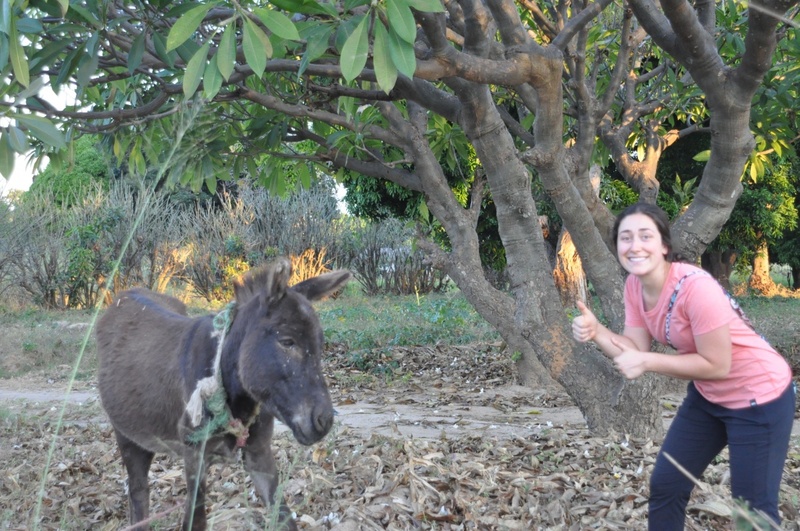 Love you both <3 Also, I found a miniature donkey in Zambezi! It wasn’t the nicest and looked kind of scary, but I got a picture with it regardless. 7 Responses to Zambezi, my third home. Jessica, fantastic post today. What a true pleasure to read of your bond with new friends from the other side of the world. I’m sure this trip will change all of the Zags in Zambezi. I’m also sure that none of you know or could possibly appreciate how much we have enjoyed all of the posts. I know our family has eagerly awaited the post each day for any and all news of your group and your experiences. It seems like our days are measured as we live vicariously through all of the words and pictures. Thank you for sharing. Enjoy the remaining time, wind down a bit, reflect on your journey , and ” just be”. Go Zags. This. Is. Beautiful. Accompaniment in action. That’s what this program is all about. You are blessed and you bless. I will just slink away now wiping my eyes and wishing you all a delightful safari. Bring an extra layer! Your description of the goodbyes hit home hard. I had plenty of ugly cries myself last year and the year before. Know this – it’s possible to have important and meaningful relationships from continents apart. It’s possible to keep going back, maybe in 5 years or maybe in 30. And it’s possible to keep Zambezi in your heart and on your mind. Zambezi is a home because of the friends who live there and that’s not something easy to lose or forget. You will all get a little bit of home through this blog in the coming years, too. That’s why we love to hear you sharing your journey with us–it brings us back home. Also this made me cry a lot because it’s super similar to a blog post I wrote last summer. Jessica, you’re a soul sister and I only met you once! Much love to you all and enjoy Livingstone. Don’t forget that important growth and learning occurs there, too, and that it’s still Zambia! The most memorable conversation I had on the trip last year was with a waitress named Chobe at an Indian restaurant. I hope (fingers crossed) to see you all soon, at least for a few minutes in the airport. Thanks for bringing light into this last month for so many of us. P.S love the miniature donkey you found 🙂 Pepper hasn’t had her baby yet, she’s waiting for you. Jessica, such a beautiful post about the bond that you formed with David & Gloria and their two beautiful daughters. All of your life the first word that we used to describe you was “kind”. You have such a kind & loving heart which you have shared with this young family. I felt like I was there with you today, imagining your tearful goodbyes and knowing that your heart was aching as mine was aching for you as I read your post. I am so happy to know that you will be able to keep in touch with them after you return home. I have enjoyed the daily blog posts and feel like I have been introduced to each one of you with each post. It has been wonderful to have a tiny insight into the life that you have all experienced so far from home. I can only imagine the strength of the friendships that have been formed between you. Enjoy the adventures that the coming week will bring! Savor the moments and soak it all up. You are experiencing an adventure that most of us can only dream about. Jess, I love you so much and can’t wait for one of those famous “Jessica hugs”! I couldn’t be any prouder of you and admire your courage and strength. PS – I forgot to say that I loved the picture of the donkey even if he is a little scary looking! It will never feel like you have enough time to experience all that you’re doing in this last handful of days, but soak it up and we’ll see you soon! You know we’re so excited to be with you next week and to hear about your trip and see your smiling face. I love that you found a miniature donkey! Give Kris a hug for me.